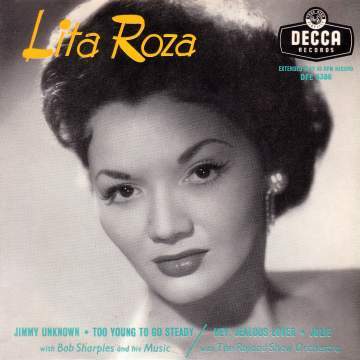 Lita Roza may well have inherited her musical talents from her Spanish descended father who played piano in Liverpool clubs whenever the opportunity arose. She was the eldest of his seven children and began work at an early age in order to supplement the family income. Factory work was among her first jobs which also included several as assistants in various Liverpool shops. However, she appeared as a dancer in a pantomime in Norwich while still only twelve, and by the time she was fifteen she was working with fellow Liverpudlian- comedian Ted Ray- in the stage show 'Black Velvet'. She was still in her teens when she managed to secure a job as a singer in the "New Yorker" -a wartime Southport club. She used this as a stepping stone to gain another job as singer- with the Harry Roy Orchestra in London. She moved on from this to work with other bands of the era including that of Edmundo Ros. However, by the time she was eighteen she had decided to retire from show business- choosing marriage to an American and a life in Miami in exchange. However, this did not last and she returned to the UK, finding employment with Ted Heath. Her years with the Heath band were probably the most productive of her long career. Her original rendition of 'Allentown Jail' is arguably the best recorded version of this fine ballad ever to have been created. In contrast, the jazzy upbeat "Blacksmith Blues" shows her versatility. Sadly, her most successful recording- and the only one many people associate with her is now widely regarded as dreadful; "How Much Is That Doggie In The Window"- a cover version of the Patty Page US hit. Lita left the Heath band during 1954 and remarried in 1956- this time to fellow musician Ronnie Harris- trumpet player with the Geraldo Orchestra. She remained a top UK recording artist during the remainder of the 1950s and even re-recorded the wonderful 'Allentown Jail'; on 45rpm. However, her subsequent recordings never really recaptured the magic she had shown while with Ted Heath. The EP shown on the right (DFE6386) - with a wonderful picture of the singer- is the earliest that I've so far come across bearing Lita's name; possibly it is her first, but I cannot confirm that. It seems strange that Decca did not put out her material on extended play before that date, but perhaps that is the case. In any event, like most of Lita Roza's early output on vinyl, this record is very hard to find and not usually cheap to buy. Pye 7N15119 1958 Pretend You Don't See Him/ Ha-Ha-Ha! Decca DFE6386 1956 "Lita Roza"
Decca DFE6399 1957 "Lita Roza No.2"
Decca DFE6443 1958 "Between The Devil And The Deep Blue Sea No.1"